Trinity's Beckerath organ is a historic instrument. Built in 1956, it is the first large mechanical-action organ in North America. It is entirely mechanical in construction except for a 1hp motor to supply the wind. Rudolph von Beckerath (1907-1976) grew up in Hamburg. He was fascinated by the organ and was especially influenced by the historic Schnitger organ at the Jacobikirche in Hamburg. He worked at first for other builders, notably Gonzalez in Paris and Frobenius in Copenhagen. In1948 he helped restore the Schnitger organ in Steinkirchen, Germany. In 1949 Beckerath set up his own shop in Hamburg. He was devoted to mechanical action (which, unlike electric action, is responsive to the player's touch) and to a powerful yet clear sound and beautiful ensemble. Beckerath's work was greatly admired by Robert Noehren, head of the organ department at the University of Michigan. Knowing Trinity needed a new organ, he brought Beckerath and Trinity together. The organ was built in Hamburg in 1956. That November it arrived in Cleveland (via the St. Lawrence Seaway), along with two craftsmen from Beckerath's firm. They reassembled the organ, and in February, 1957, Rudolph von Beckerath arrived to make the finishing touches: in a process called voicing, he made final adjustments to every one of the 3,467 pipes. "Having had the privilege yesterday of playing the new organ at Trinity Evangelical Lutheran Church, I feel I must certainly write to you at once to offer most hearty congratulations on this wonderful instrument! Both in your choice of the builder, and in the instrument that Mr. von Beckerath has built for you, the church has acquired one of the truly distinguished organs of the country. In fact, where else can one find an organ to equal this [in] tonal excellence." Trinity's Beckerath inspired a new era of organbuilding and playing in America. While Trinity's Beckerath is best-suited to music of the northern European Baroque and in that tradition, this organ's integrity and beauty serve music of other periods and styles. A number of instruments in or near Cleveland are designed for music of certain traditions: the Renaissance, Spanish Baroque, Italian Baroque, French Romantic era, or early 1900s. It is wonderful to hear music on an organ designed expressly for that music-and fun to compare and contrast the sounds and specifications of other organs to those of the Beckerath. Trinity's present sanctuary was built in 1873. The total cost to build the brick structure was $31,000--debt-free. Member families mortgaged their homes to see the construction completed and paid in full. and beauty Trinity is not a massive church (127 feet by 62 feet by 42 feet), but its 175-foot high steeple stands as a lighthouse to the surrounding community. Inside, its high arches and its original stained-glass windows and German wood craftsmanship--filled with Christian symbolism--offer visitors an experience of solemn, peaceful beauty. The people of Trinity Lutheran Church invite you to visit and experience the sanctuary personally. Sunday morning worship, always featuring the Beckerath organ, is at 9:30 a.m. 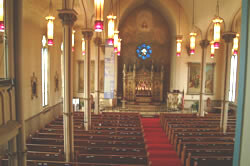 In 2001, Trinity launched a capital campaign to begin renovating the sanctuary over the next several years. For nearly 150 years, Trinity has shaped the lives, experiences and faiths of thousands of people. Through Trinity churches were planted, including Christ (Robert Ave. & W. 43rd), Immanuel (Scranton Road) St. Luke (W. 85th & Sauer), St. Paul (Detroit Road in Westlake), and the Hispanic mission congregation El Buen Pastor (W. 28th). Through Trinity ministries and organizations began, including Lutheran Children's Aid, Lutheran Home for the Aged, Lutheran Hospital, and Lutheran Metropolitan Ministry. Outreach is at the heart of Trinity's ministry to Appalachians, Hispanics, urban youth, and white-collar professionals living and working in downtown Cleveland. With the Beckerath as its centerpiece, Trinity's cultural offerings continue to expand, including weekly and annual concerts and other special celebrations that draw classical music enthusiasts from across northeast Ohio. Healthy, growing and a source of innovative ministry, Trinity's vision is to again be a source of glory to God in citywide Lutheran service and mission.